Argument over desirability of Biafra by some Nigerians in India has been blamed for the death of N. Chigozie, a 33 year old who came to India with a student visa. Indian police in Bengaluru are already probing the death. The body of the Nigerian was found near the railway gate in Hennur, northeast Bengaluru, in the wee hours of Monday. Chigozie, a resident of Hennur, was found with head injuries at 2am; his motorcycle had skidded off the road.While the body has been shifted to Ambedkar hospital for autopsy. Kothanur police, based on his brother’s statement have registered a murder case, reports the Times of India. “It seems to be an accidental death. Preliminary evidence shows Chigozie, who was speeding on his bike, crashed into an iron railing and died of head injuries. He was not wearing a helmet. But his younger brother Nieskho claims he was murdered,” police said. On Sunday evening, Chigozie, Nieskho and four other Nigerians partied at African Kitchen restaurant at Byrathi near Hennur. “The six revellers quarrelled over sharing food and assaulted each other. Nieskho went to a nearby hospital to treat his injuries and Chigozie followed him on bike. While returning from the hospital, Chigozie died,” police said. But in another account given by BangaloreMirror, Chigozie’s brother, whose name was spelt as Nanso, claimed his brother was killed after an argument with other friends over Biafra. Here is the report in the newspaper: A 33-year-old man from Nigeria was found dead under mysterious circumstances near Geddalahalli on Hennur Road in the early hours of Monday. The brother of the victim, identified as Chigozie, said he may have been murdered. Chigozie was found dead near the Railway bridge at Geddalahalli. The victim, who came to India on a student visa, was doing some business in the city, according to police. The victim, along with his brother Nanso, is said to have partied with a group of friends at a house in Byrathi. During the party, it is alleged that the brothers and their friends had an argument over a political development in their country. Police said both the brothers were allegedly beaten up. Nanso, who had come in his car, drove to a nearby private hospital and is said to have taken treatment. Chigozie, who was returning home on his bike, was found dead near the railway bridge. “Nanso suspects that his brother could have been killed. However prima facie evidence suggests that the death could also be due to an accident. The victim could have skidded and fell from the bike while riding home. It was raining heavily. But a murder case has been registered based on his brother’s complaint and investigations are on,” S Girish, DCP (North East) told BM. 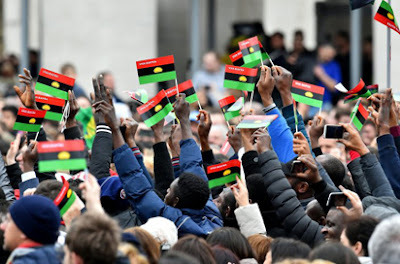 The Kothanur police, investigating the case, said the group of friends who were partying were discussing about the political turmoil back home over the formation of a separate state in Nigeria(Biafra) The discussion led to assault and the brothers were badly beaten up.